On Saturday, the Reds travelled across to Livingston for the league season opener in Tennents East 1. This was a special day for Livingston Rugby Club as it marked the start of their 50th anniversary season. 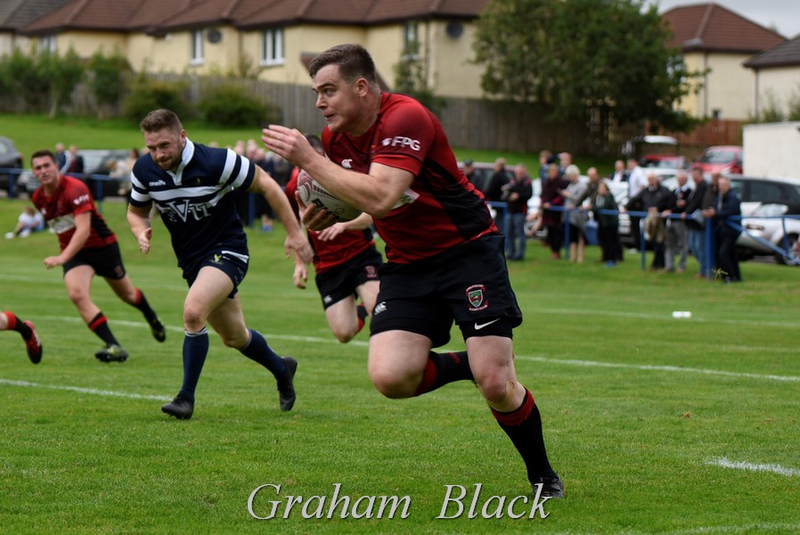 They had requested the League to schedule them a home start against old rivals Linlithgow and many former “Dark Blues” and “Reds” were there to mark the occasion. Also present, as guest of honour, was Dee Bradbury – the first female President of Scottish Rugby – and she was welcomed by Livingston’s own female President Lee Anne Steel. The Reds’ team showed quite a few changes from the previous week – team selection again being significantly affected by a number of injuries and non-availability of key players. The Reds got off to a great start and took a 6-0 lead through two penalties from John Strachan following excellent work at the turnover, firstly by Joe McKillion following up the initial kick off and secondly, by Ross Plenderleith following up a long kick ahead a few minutes later. For the next 10 minutes the game was back and forward, but gradually the home team began to exert some sustained pressure and were eventually rewarded with a penalty to bring the score back to 3-6. The big Livi pack were putting pressure on the Reds scrum and, together with good line-out ball, claimed a large slice of the possession and territory for the rest of the half and well into the third quarter of the match. The Reds defended well and their tackling was much improved on the previous week, however when they did get their hands on the ball, the Livi defence was up fast to stifle any move and to pressure the ball carriers. That Livingston only scored two tries in that time of possession dominance was a testimont to the Reds committed defence. Midway through the second half, the Reds were penalised after valiant defence near their own line and Livingston kicked a penalty to extend their lead to 21-6. The writing looked to be on the wall for the Reds as from a scrum close to the Reds line, the stand-off put in a crossfield kick to his unmarked winger. However, the player was unable to gather the ball and Ross Plenderleith, covering across on his own line, claimed the loose ball and took off up the wing, outpacing the home defence to go the length of the field for a try which pulled the score back to 21-11. This spurred the Reds into greater action and they came close to scoring again on a couple of occasions, with plenty time still left on the clock. 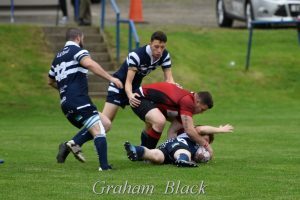 A couple of wrong options, some loose passing and a determined defence kept the Reds at bay and, at the close, the home team claimed their third try through their right winger from short range to leave the final score at 26-11. The end result was fair, as Livingston were the stronger side over the whole match and their win was celebrated by the big home support on this their special day! However, the Reds should take heart from their overall performance – they left 18 points out on the field, including a disallowed try, which could have sneaked them the game on another day. The pack deserves special mention for their sterling efforts with back rower Joe McKillion and young prop Sam Buckley coming in for extra plaudits. Rab Cairns (captain); Ross Plenderleith, John Chapman, Ross Tulloch, Cammy Murie; John Strachan, Jamie March; Sam Buckley, Euan Mochrie, Calunm McKeown; Neil Lockhart, Duncan McClymont; Andrew Archer, Joe McKillion and Cameron Dori-Muir. Subs (all used) – Steven Grant, Stuart Cunningham, Cal Thomson and Peter Millar. Next weekend, the Reds have a BYE week, a product of an 11 team league, before they welcome Hawick Harlequins to Mains Park on the 15th September for what will be “former players day” aka “a pie, a pint and a programme”. The 2s and the 3s both have scheduled home matches on Saturday 8th September, with kick offs at 3pm.